Following a three-week break, the Eagles opened up conferences play Jan. 5 in front of their home fans in Price, Utah. The fans got their money’s worth as the team would take the nationally ranked defending champion Salt Lake Community College to the final play of the game. It almost seemed as if the game was being replayed from last year’s fan appreciation night. The team fought hard all game and came up short, losing in the last seconds of the game, 72-73. The team was lead by sophomore big man Cam Bailey who ended the night with 23 points and four rebounds. With only two other players scoring in double figures, the Eagles looked desperate for extra scoring down the stretch as the offense was run through Bailey most of the game. Two days later, the team faced off against Colorado Northwestern Community College Jan. 7. The game came down to the final possession like it did against SLCC two days before and again would see the Eagles come up short, 52-53. Led by Roman Mcknight, who posted a double-double in the contest with 23 points and 12 rebounds, which accounted for almost half of Eastern’s points. The team again saw offensive struggles as Quinn Peters was the only other player besides Mcknight to tally double-digit scoring with 12 points in the game. Following shocking one-point back-to-back losses, college administrators thought the team needed a change so they terminated assistant coach Scott Fields. The reasons for this are still unknown. In the team’s first game without Fields, the men traveled to the College of Southern Idaho on Jan. 12 to take on the ranked Golden Eagles’ team. The two teams just looked uneven in the contest as CSI looked like they could do whatever they wanted on the offensive end and the Eagles had no answer for them. 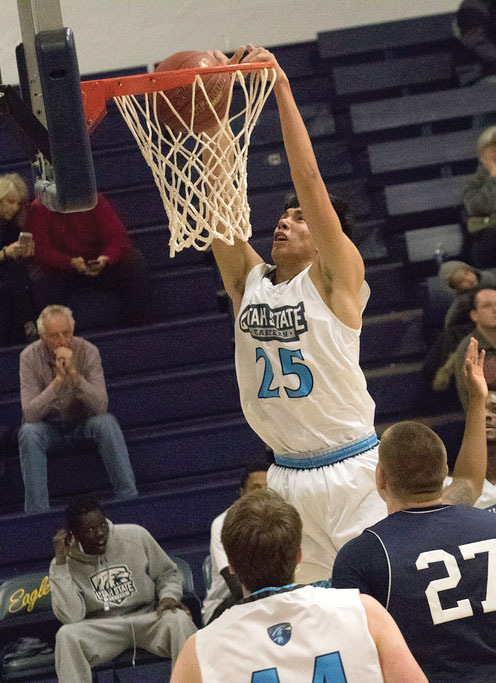 The team continued to struggle offensively as the leading scorer for the Utah State Eastern Eagles was Bailey with 16 points and 10 rebounds. With Coach Fields gone, the team now only has one coach, Adjalma Vando Becheli. After the team returned from Twin Falls, they took on their rival Snow College Jan. 14. The Eagles would eventually fall to the Badgers in a close contest, with the final score being 79-86 in favor of the Badgers. The Eagles would finally have a player eclipse the 20-point mark as Peters ended the game with 26 points, five rebounds and three assists. Bailey would have another impressive game with 19 points and seven rebounds to go along with it. On Jan. 17, the team traveled north for a rematch against SLCC Bruins. The team would eventually fall short 76-86. Peters led the team in scoring with 14 points. Throughout their first-four-conference games, the team struggled to score and this night was no different. Although they only scored 76 points, the Eagles had five players in double figures. Mcknight scored 12 points with Bailey scoring 13 points in the contest. Sophomore guard Koel Cutler added 11 points off the bench and freshmen forward Kristupas Totoris added 10 points to the team’s total. The Eagles conclude its four-game-road trip when they visit CNCC Jan. 17. It can be watched online at USU Eastern athletics website. On Jan. 26, the Eagles return home to play Snow College and on Jan. 28 host CSI. Both games are in the BDAC.